Meet Muasya Mulela, a middle-aged seasoned farmer from Machakos county, eastern Kenya. 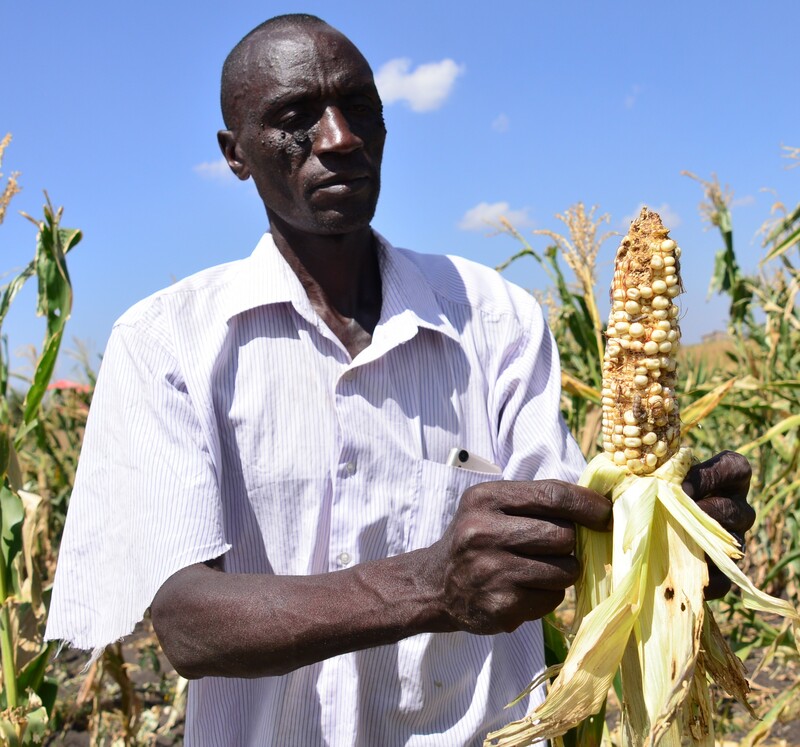 Muasya is counting losses in his 6-acre maize farm due to the fall army-worm that has devoured his crop, causing severe devastation in its wake. “This pest has destroyed everything and I have harvested nothing this season,” he reveals. Before the fall armyworm infestation, Muasya was harvesting approximately 50 bags of maize per season. Maize has been his family’s lifeline. Sadly, the father of five is now worried that his wife and children face an uncertain future following the pest invasion. Having cultivated maize for close to two decades, Muasya confesses that this is first time he is encountering destruction of this nature. “I have never seen anything like this,” he said agonisingly. After toiling to access pesticides to control the pest, Muasya regrets that the fall armyworm has continued to eat up his crops unabated. About one kilometre from his farm is the home of Elizabeth Nduku, a widow and maize farmer who has also borne the brunt of the pest. “My crops have died because of the attack by the fall armyworm and there is hardly anything left in the farm,” she lamented. Nduku, 55, said she has gone through a harrowing experience trying to fight the pest with efforts not bearing any fruits. “Although I sprayed pesticide on the crops, the pest did not fall off but continued with its destruction,” she explained. She lives from hand to mouth and can no longer afford to purchase chemicals to effectively control the pests. The mother of four narrates a harrowing experience of how she fell and collapsed following heavy exposure to the chemicals she was spraying. “After inhaling the chemical, I felt dizzy, then fell and collapsed only to be resuscitated by my neighbours,” she recounted. The disheartened woman said she later learned that she had been duped into buying livestock insecticide disguised as fall armyworm pesticide. 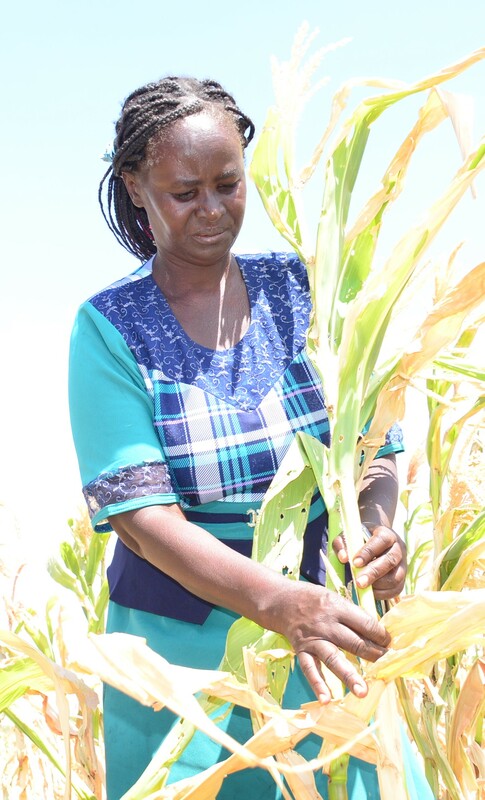 A distraught Elizabeth Nduku assesses the damage of the FAW on her maize farm. Her misery, compounded by the fall armyworm attack, has forced their children to run to urban areas in search of informal employment in an effort to make ends meet. The heart-wrenching experiences from Muasya and Nduku are replicated across maize farmers in 27 counties in the country who are grappling with the pest. Scientists from the Kenya Agricultural and Livestock Research Organisation (KALRO) under the Water Efficient Maize for Africa (WEMA) project have been conducting national field trials to evaluate the performance of Bt maize and provide sustainable solutions against pest invasion and drought in the country. “In the course of our research, we have demonstrated in regulated experiments, in western and eastern Kenya, that Bt maize is not only able to control the stem borer, but also the fall armyworm,” said Dr. Murenga Mwimali, a maize breeder at KALRO. Farmers in Kenya are urging the government to fast track the adoption of genetically modified crops that will see the commercial release of Bt maize eventually marking the end of their woes. “I will not hesitate to accept genetically modified maize if it resists pests and drought,” Nduku ardently acknowledged.